It's no secret that I love jewelry. :) It's so much fun to find new places to feed my addiction. I was thrilled to stumble upon A Pretty Rock a while back. There are some absolutely STUNNING pieces in that shop! If you are like me, and you really love adorning yourself with all sorts of unique, pretty baubles, then you simply MUST check out A Pretty Rock. You will find pieces to fit any budget. I contacted the artist behind the gorgeous designs, Yazmin, and asked her if she'd be interested in hosting a giveaway for my readers. She agreed and sent me a pair of the sweetest earrings to review. 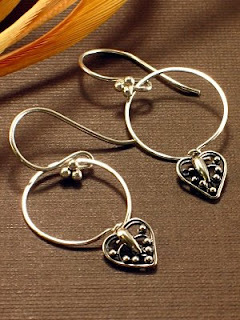 The Love Comes Full Circle earrings are made from sterling silver. There are detailed filigree hearts which are part of a circle hoop. The filigree hearts have been oxidized to bring out their delicate details. The earrings hang approximately 1 1/2” (3.81 cm) from the top of the earwire. I love wearing these earrings, and receive numerous compliments when I do. They are truly more beautiful in person than they appear in the photo. I have already told my husband that I would love to be "surprised" with Yazmin's Turquoise and Crystal Spike Earrings (pictured above). These beauties caught my eye immediately. Rustic yet flashy enough for any special occasion, these earrings are made with aurora borealis coated czech crystals and oh so beautiful turquoise rondelles. Separating both rondelles are 3 individual twisted wire jumprings. The bali spike below the turquoise rondelle adds the finishing touch. The earrings hang 1 5/8” (4.13 cm) from the top of the earwire. All metal is sterling silver. Simply stunning, don't you think? Flora - Ring - Mother of Pearl Button with Carved Flower Turquoise Wrecker Ball & Chain Necklace Would you like a chance to own one of these pieces? Yazmin has offered one living life one day at a time reader a chance to win a $25.00 gift certificate to A Pretty Rock. Visit A Pretty Rock and then post here and tell me which item you want to own. If you are not a blogger, email 3 of your friends telling them about this giveaway, and cc me at colleenstearns@gmail.com. ENTER DAILY!! !Once you post your initial entry, you can come back daily and tell me you want another entry by telling me you want another entry! For THREE extra entries, blog about this giveaway with a link back to my site and A Pretty Rock (be sure to post your link here so I know where to find it). Click on the FOLLOW THIS BLOG link on my left sidebar. Tweet about this contest on Twitter (Be sure to follow me on Twitter too- see link in my sidebar.). Make sure to leave a link to your twitter message in your comment. You can do this once a day. Please make sure to come back each day and leave another comment with your new twitter message link. IMPORTANT:Be sure to leave a separate comment for each entry. If you earned two or more entries for a specific item (such as #1 and #4 above), be sure to leave me a comment for each of the entries you've earned. *Enter by 9pm (EST) on Monday, March 2, 2009. My favorite are the Hint of Glint - Mystic Gray Quartz Onions and Sterling Silver. Wow, there are a lot of things that I'd love to own. I think my favorite is the "Ice" Quartz bracelet. Am now following you (but not stalking, hehehe). I would love to own the Copper Coin Pearl Vermeil Earrings. They are so pretty! My favorite is the Bracelet - Criss Cross Cuff - Golden Pearls. Turquoise and Crystal Spike Earrings would be my choice. Turquoise and Crystal Vermeil Spikes earrings! Climbing the Vine Necklace - Keishe Pearls, Smoky Quartz & Vermeil is my fav, but I also love Beer Quartz Shield Earrings, and the hairpins. My girls would LOVE the hairpins! i love Bromeliad Cascades - Amethyst, Pink Pearl and Opal Chandelier Earrings!! i love the "Ice" Quartz bracelet. I think it would be awesoemw with a LBD!! I like Turquoise and Crystal Vermeil Spikes. I LOVE The One - Pearl Coin Necklace! I love the chandelier wrap earrings. Very pretty jewelry! I'm an earring fanatic so I love the Hint of Glint - Mystic Gray Quartz Onions and Sterling Silver! I love the Sodalite Heart Cascades earrings, just beautiful. I've linked you both to my blog. I didn't know you were on Twitter...I'll be looking you up there. Thanks! Thank you all for your comments on my jewelry. They are certainly appreciated! I love the Copper Coin Pearl Vermeil Earrings. Thanks for the review and giveaway! Love the Hint of Glint Gray Quartz earrings--very pretty and simple! Thanks for a great giveaway! 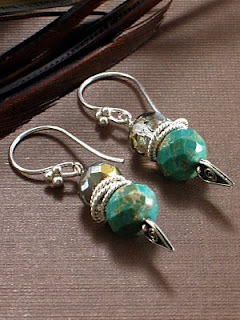 Oh I love the Fresh Cut - Quartz and Peridot Wrapped Sterling Silver Earrings!!! Those are just gorgeous pieces!! 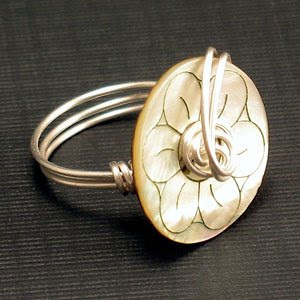 I also like the Flora ring on the website...beautiful colors! i love the Ice - Rock Quartz and Rutilated Quartz Bracelet! My favorite is the Girls Just Wanna Have Fun earrings! Love the ice rock quartz earrings. Would love another entry for the 24th! Thanks! Back for another entry!! Thanks! i think the most stunning pieces are Beer Quartz Shield Earrings! I want today's daily entry! I love the Framed Circle Drop - Gold-Filled - Botswana Agate Teardrop. It's so gorgeous!! I would like another entry. I would like my extra entry today. I'd love another entry! Enjoy your day! 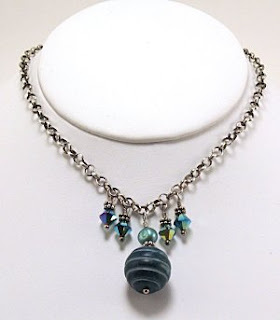 I like Turquoise Wrecker Ball & Chain Necklace best. I want a daily entry! i would LOVE to have the Bromeliad Cascades - Amethyst, Pink Pearl and Opal Chandelier Earrings. I'd actually like to give them to my mom. I'm BACK!!!! And I'd love another entry for today!! Thanks! Back for another entry! Have a great Friday! I would love the Climbing the Vine Necklace! Back for another entry! Have a great Saturday! back for another entry today! thanks! Count me in for today's entry. I'm back for another entry please. i would like my extra entry for today. I love the Infinity - Layering Necklace - Sterling Silver Prehnite, really beautiful. Back for today's entry - 3/1/09, thanks! Back for my final entry! Thanks! I'm back for one last entry...enjoy your day! Thanks! I want Bromeliad Cascades - Amethyst, Pink Pearl and Opal Chandelier Earrings. Yay just in time! I'd love the Change of Seasons - Hessonite, Carnelian and Serpentine Gold-filled Necklace. Thanks!